Captain America is a hero in the Marvel Universe. Multiple characters have worn the mantle of Captain America but the man most associated with it is Steve Rogers. The Captain America in the comics has recently been revealed to be a Hydra agent for thoughts on this see our podcast below. Who is in the tube in Captain America Civil War? It is not Winter Soldier! Steve Rogers is born to a poor family in New York City. While he is tough and strong willed, his body is frail and weak. As War World II begins Rogers tries to enlist but is rejected due to his physical limitations. The strong will of Rogers, impresses US General Chester Phillips who selects Rogers to be the test subject of, "Project: Rebirth" a US Super Soldier project. Project Rebirth is the brainchild of Dr Abraham Erskine who is a German defector and renowned biochemist. Erksine had spent much of his life studying the human species and had a long history of experimenting with diets, work out programs, and serums that use vita rays. Erskine is appalled when he witnesses Baron Zemo and Hitler use a deathray on an innocent human test subject. Afterward, Erksine fakes his death and defects to the United States. He takes the alias Josef Reinstein to hide himself from the Third Reich and begins to work on Super Soldier formula for the United States. The experiment on Steve Rogers is a stunning success. Rogers goes from being a weak man to a person in peak Olympic level condition. Rogers effectively can run as fast as the fastest man, has the strength of the strongest man etc. While not a super human perse the combination of having all of the peak level human capabilities make him nearly equal to one. Project Rebirth has been shown taking various forms of injections, oral serums and rays. All of the steps were not recorded by Erskine. Dr Erskine is killed by a Nazi spy before he can repeat the process or record its steps, leaving the United States with only one super soldier Steve Rogers. Note: There have been numerous attempts to duplicate Project: Rebirth that have typically had terrible results. These attempts include the creation of the Hulk villain the Abomination, as well as Manthing. The United States Military is not happy about having only one super soldier and do not initially know what to do with Rogers. 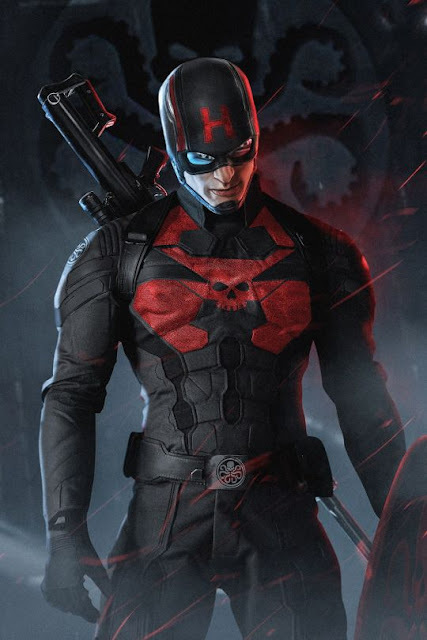 Eventually, the US Military brand him as a patriotic American hero meant to inspire the troops as a counter weight to the Axis Super Villains like the much feared Red Skull. Captain America gains a side kick when the teenage mascot of an American platoon Bucky Barnes discovers Steve Roger's true identity. He works with Peggy Carter, Bucky Barnes and the Howling Commandos to defeat the Axis powers. Captain America and Bucky become a counter intelligence team often battling behind enemy lines and thwarting the aims of Hitler, Baron Zemo and the Red Skull. Captain America and Bucky also fight in the Superhuman group called the Invaders always battling the Nazis. As WW2 is in its closing chapter Captain America and Bucky find themselves on an experimental drone plane containing a massive explosive. The plane explodes over the Antarctic and both Bucky and Captain America are presumed dead. The body of Captain America is found in a block ice. He has been frozen but kept alive since 1945. His survival is in part due to the enhancements to his body from Project: Rebirth. With his peak human abilities, military experience and martial training the revived Captain America assumes leadership of the Avengers. He has generally been considered the leader of the Avengers since that time. Nick Fury who has been preserved by the infinity formula is now in charge of SHIELD and Captain America often undertakes missions to battle Hydra, Communistic and Nazi elements on behalf of SHIELD. He stops villains from getting the powerful bloodstones an adventure that puts him against a resurgent Baron Zemo and a new scrappy fighter, Crossbones. While working for SHIELD Captain meets and falls in love with Sharon Carter AKA Agent 13 who is the niece of his former WW2 compatriot Peggy Carter. Captain America also develops a lasting partnership with the first African American superhero, Sam Wilson the Falcon. The Falcon has the ability to fly and has a strong martial skills. During the Watergate scandal that engulfs the country Steve Rogers feels disillusioned by the United States. He takes off his patriotic costume and rides across the country under the moniker Nomad (A man without a country). He drives a motorcycle, wears a black outfit, and battles crime as he goes through the countryside. He later returns to his Captain America role and leads the heroes of Earth in the Secret Wars and in the Infinity War. During the event known as Civil War, Captain America leads the opposition to the pro-registration movement headed by Roger's longtime friend Tony Stark aka Iron Man. This story arc ends when Captain America being led to trial is assassinated. Initially it was believed that Crossbones had killed Captain America however it later revealed that the act was done by a brain washed Sharon Carter. During this time many men consider wearing the Captain America Mantle including Clint Barnes/Hawkeye, Frank Castle / The Punisher, and Sam Wilson / The Falcon. In the end the mantle goes to Bucky Barnes who had been revived earlier as the Winter Soldier. Steve Rogers is later revealed to be alive and returns but allows Bucky to keep the Captain America Mantle. During the "Fear It Self" storyline Bucky is seemingly killed and Rogers returns as Captain America. Recently, the super human serum with Steve Rogers has been neutralized causing him to age rapidly. Now in the body of old man Rogers has backed off from the front lines and serves as coordinator and general. The mantle of Captain America is now worn by Sam Wilson formerly known as the Falcon. In a controversial move Marvel has reintroduced Steve Rogers Captain America but this has come with the revelation that Captain America has been working for Hydra since WWII. He was converted into a Hydra agent by his mother and has worked for the organization ever since. It seems the character Kobik who is the living embodiment of the cosmic cube was used by the Red Skull to convert Rodgers into believing he has always been a Hydra agent. Rodgers had sought out Kobik to help end the villain assault on Pleasant Hill. However, the meeting was set up in advance by the Red Skull. Crossbones appeared and began to brutally beat Steve Rodgers. Rodgers had the superhuman serum removed from his body and was thus old and no match for Crossbones. Wanting to help Rodgers, Kobik altered to Rodgers to be in Kobik's mind perfect. This meant returning the serum to his body, deaging him into his prime and also making him a loyal believer in Hydra. In Kobik's mind Hydra made more sense than SHIELD. Kobik did not change the past but effectively altered Rodgers memories. This plan may have worked out too well as Rodgers surpassed the Red Skull as the Number 1 Leader of Hydra and killed off Red Skull. Rodgers then amassed an army of loyal supervillains to take over the world in the name of Hydra. Captain America uses his Shield both to protect him and as a weapon. It is made of a metal alloy fusing Iron and Vibranium. The process that made the Shield has never been duplicated. Much like the Captain America mantle itself the Shield serves as a symbol of hope and freedom. Captain America has all the peak human capabilities of a human. He can run as fast as the fastest man, has the strength of the strongest man. All of his physical skills such as his endurance, his reflexes, agility, and immunity to disease are at this peak level. His intelligence is not increased but it is not hindered either. Captain America has a life time of martial experiences both on the front lines in wars, serving on various superhuman squads as well as a counter espionage agent. He is considered to be a great leader as well as a moral compass of the entire Marvel universe. He is in effect a living symbol of American values. Captain America / Steve Rogers is played by actor Chris Evans in all of his MCU appearances. Captain America appeared in film reels back in 1944. He is the first Marvel character to appear on film. Captain America could be seen frozen in the ice of in the after credit scene of the Incredible Hulk. Captain America's Shield is shown amongst the items in Tony Stark's laboratory. The story shows the creation of Steve Rogers into Captain America, his battle against Hydra and subsequent freezing in the Arctic. At the end of the film he has been revealed to have been found and revived by SHIELD in the present. Captain America becomes a leader of the Avengers a new team of super heroes created by SHIELD to battle against massive threats. 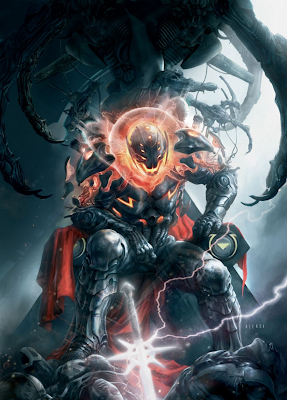 He leads the team to defeat the evil Loki and alien army of Chitauri. 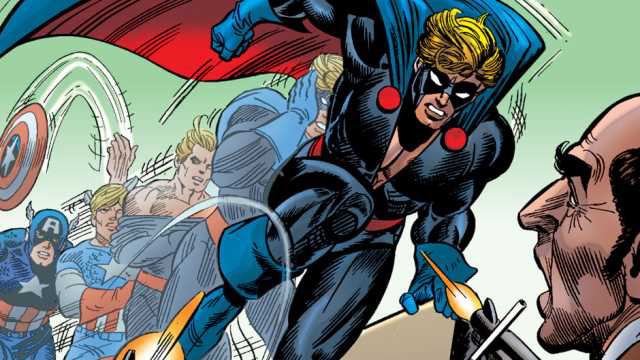 Captain America becomes a member of SHIELD and struggles as a man out of time. He is confronted by changes in the world dynamic that have left him standing in a moral gray area as well as unexpected threats from his past, that have evolved in dangerous new ways. Captain America breaks from his Avengers as a Super Hero registration act is forced upon the powered community. His battle to protect his old best friend Bucky leads him into the cross hair of Iron Man. At the end of the film Rogers gives Tony Stark his Shield. Captain America is no more. Steve Rogers now goes by the name of Nomad and wears a black outfit. He no longer has any connection to the Avengers and is effectively a fugitive. When duty calls and the world is faced with an oncoming calamity will he remain away from the Avengers? Or will he come back to be Captain America?